Studio 544 Web Design in Hutchinson, MN worked closely with Sara Romoli and her New York-based premium Italian clothing collection Trappola di Venere. The collection consists of luxury Italian made fashion corsets, t-shirts, tops and jewelry accessories. Old world Italian craftsmanship and attention to detail ensure that each piece of the Trappola di Venere collection is of the highest quality. They have selected the finest, luxurious materials and Italian fabrics in each style to maintain the spirit and romance of a bygone era. Their goal is to bring out the natural beauty, femininity and inner glamour of every woman. This was a multiple phase project that consisted of modifying the collection’s already existing web site to update it with new features, images and additional pages. 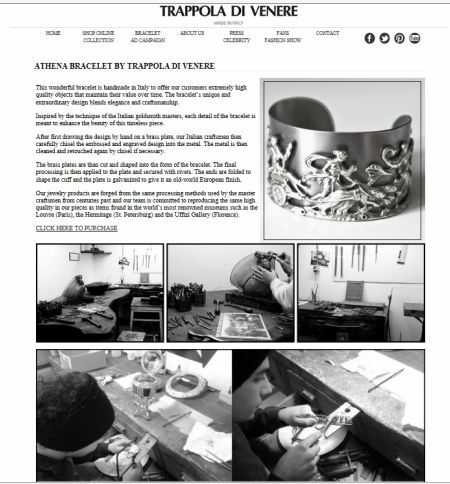 Studio 544 also set up a full featured e commerce online store for the Trappola di Venere collection at http://shop.trappoladivenere.com. In addition to the above services, Studio 544 is assisting Trappola di Venere with their online marketing including blogging, Facebook and Twitter posts; online store promotions and more.